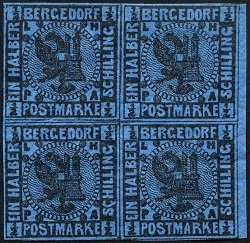 German States stamps for the postal district of Bergedorf were issued in 1861. In 1861, the little town of Bergedorf had a population of barely 3,000 and the postal district had a population of only about 12,000. 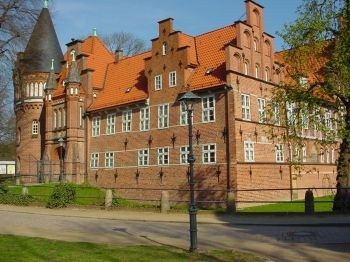 The town of Bergedorf had been jointly owned by the Hanseatic city-states of Hamburg and Lübeck, and in 1868, Hamburg bought Bergedorf from Lübeck for 200,000 Prussian Thalers. Since then, Bergedorf has been a borough of Hamburg. The five German states stamps of Bergedorf shown above were issued on November 1, 1861. A later printing of the 1/2 S. denomination on dark blue paper was made in 1867. They are lithographed, on colored, unwatermarked paper, and they are imperforate. 1/2 S. (1861 - Mi. #1a, Sc. #1) - Black on Pale Blue. 1/2 S. (1867 - Mi. #1b, Sc. #1a) - Black on Blue. 1 S. (1861 - Mi. #2, Sc. #2) - Black on White. 1 1/2 S. (1861 - Mi. #3, Sc. #3) - Black on Olive Yellow. 3 S. (1861 - Mi. #4, Sc. #4) - Blue on Light Rose (Pink). 4 S. (1861 - Mi. #5, Sc. #5) - Black on Brownish Orange. The center of the stamps featured a design consisting of the right half of the coat of arms of Hamburg and the left half of the coat of arms of Lübeck. 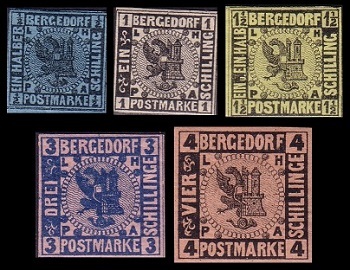 Hamburg's stamps were officially sold alongside those of Bergedorf at the post office counters, so very few of the Bergedorf postage stamps were actually ever used. As a result, supplies of the originals, including multiples, are relatively common today. The original printings, in mint condition, sell for between 10 and 50 Euros each. Modern reprints are plentiful, and those are worth about 5 Euros each on today's market. For details on how to identify the originals, reprints, and cancellation types, please refer to the major specialized catalogs and to the Serrane Guide. 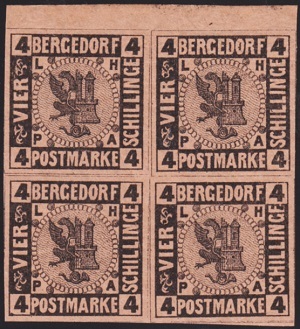 Since most of the stamps sold and used in Bergedorf were those of Hamburg, USED Bergedorf stamps are VERY RARE. It can be safely assumed, with any off-cover, non-certified, used Bergedorf stamp anyone should encounter today, that the cancellation is probably FAKE! In 1868, Bergedorf, along with Hamburg, became part of the North German Confederation, and their postal service was replaced by that of the North German Postal District. BE VERY CAREFUL when buying any Bergedorf stamps, and those of Lübeck or Hamburg as well, especially if they do not have BPP authentication markings or certificates of authenticity.